So, for this review I was sent two PetCakes from the Forest Animals collection. I was sent Roco Coco and Nutty Nicky. These two characters are ADORABLE!!! When my box arrived and I opened it, my daughter was immediately excited. We just HAD to pull both of them out so she and her brother could "inspect" them. Roco Coco is a cute little raccoon and Nutty Nicky is a squirrel...who is holding onto an acorn. As you can see, my children loved these and Jacob was constantly trying to take his sister's. Ha ha!! PetCakes retail for $12.99 each and there are many from which you can choose. They can also be purchased directly from the website. 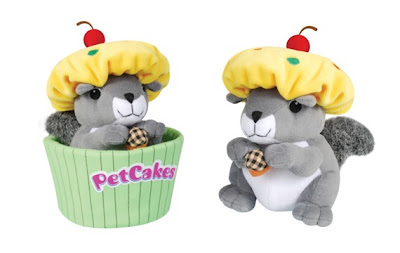 So, in my opinion...PetCakes are very cute toys. My children love theirs (as you can tell) and they truly are a one-of-a-kind stuffed animal. They make great gifts as well and would also look super cute as a birthday party favor for your little one's celebration!! Visit PetCakes and leave me a comment telling me which PetCake is your favorite. You do not have to be a blogger to enter, but you must have a valid email where you can be reached should you win. If you do not leave an email address, it must be where I can easily find it. This giveaway is open to US residents and will end 12/5 at 11:59 pm EST. The winner will be chosen using random.org and will be notified by email. The winner will have 48 hours to respond, or another winner will be selected. 1. "Like" PetCakes on Facebook. 2 entries, so 2 comments. 3. Follow me on Twitter. Leave a comment to let me know that you did/do and your Twitter name. 1 entry. 4. Tweet about this giveaway. Leave a comment with the link. 3 tweets per day (at least 1 hour apart). 3 comments per day. 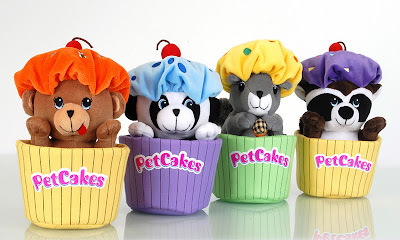 Enter to #win a PetCakes Plush Toy @coupons4moms @PetCakesToys Ends 12/5 http://tinyurl.com/6ma2jcp CUTE CHRISTMAS GIFT FOR CHILDREN!! 5. Blog about this giveaway. Leave a comment with a link. 5 entries, so 5 comments. 7. Leave a comment on any review only post. 1 entry per post commented on. Unlimited. Disclaimer: I received no monetary compensation for this post. I did receive 2 PetCakes for review purposes. All quotes and stock photos are from the PetCakes website and email. Prize will be provided and shipped by sponsor. All thoughts and opinions are 100% mine. My favorite is Blueberry Buddy. I like Honey Coco Coconut. I like pet cakes on fb2. I'm a gfc follower 3. I Like" PetCakes on Facebook. I think my daughter would love Randy Candy! I am a facebook fan of Petcakes (Marysa N). I like Nutty Nicki! So cute! Thanks! I like Nutty the squirrel. My favorite PetCake is Roco Coco. LOVE Twinkle Sprinkles!! How sweet! Nutty Nick! Love his tail. Honey Cakes is my favorite. I like Twinkle Sprinkles and Coco Coconut!